Wobbly neck joints are easy. But why would you want to make one? For fun, and pose-ability. Wobbly joints work especially well on tiny bears. When people pick up a wobble jointed bear in my studio, their first reaction is often one of shock. When the head flops sideways, they think it's going to fall off any moment. As soon as they hold the bear for a minute, and see how cute it is with the head tilting in all directions, they fall in love. 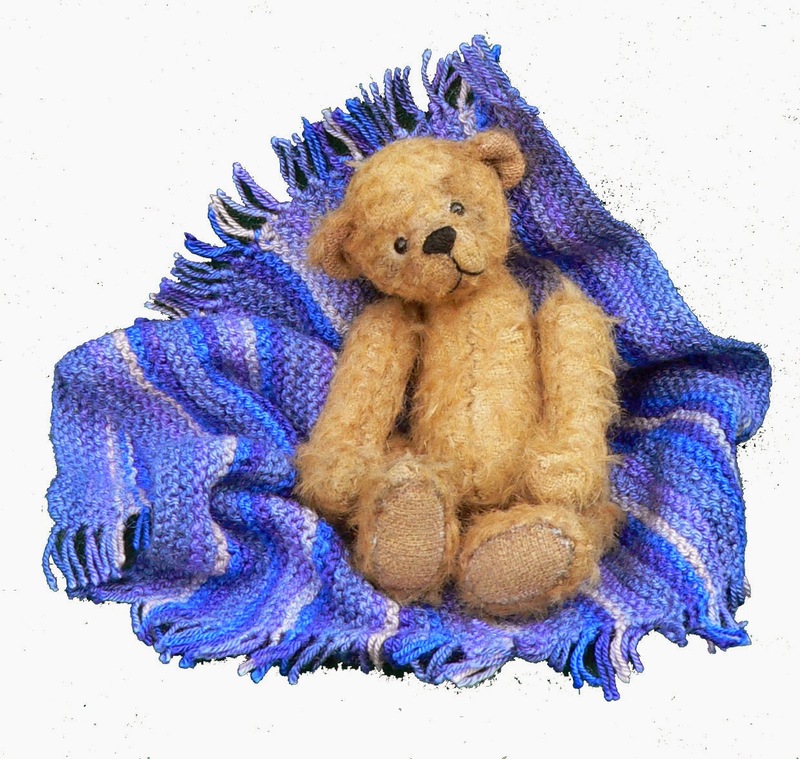 The bear on the blue blanket is Inga, a little sister for Angus. The tilted head adds lots of expression to her pose. To make a wobble head joint, you will need two discs, and two split pins instead of the usual just one. To make sure that the wobble joint 'wobbles' properly, the split pins need large round heads. I usually bend open the split pin, and enlarge the head with chain (round) nose pliers. On the left you can see the result. Nice big round head. Do the same with the second split pin. Hook the two split pins together. Slip a split pin through a disc and use needle nose pliers to curl its ends. Keep turning the curls until they fit snugly against the disc. There must be no play between the disc and the curls of the split pin. Wave the joint around and check that the split pin that is hanging moves freely. In the picture you can see that mine is swinging nicely. Now we are ready to insert the joint into the head. The disc with the curled split pin is inserted inside the neck opening. Gather the neck opening closed and end off securely. Note: Because the neck will be able to tilt sideways on the body, the underside of the neck will be visible. The neck opening should be closed very neatly! If you usually have trouble with this, refer to the lesson about using a fabric circle to close the neck. I did not use a fabric circle to close the neck this time, but I did gather up the fabric very neatly. You can see that the head of the split pin that is inside the neck is nicely embedded in the fabric. Attach the head to the body, using a disc and the second split pin. Keep curling the ends of the split pin until they fit snugly against the disc. 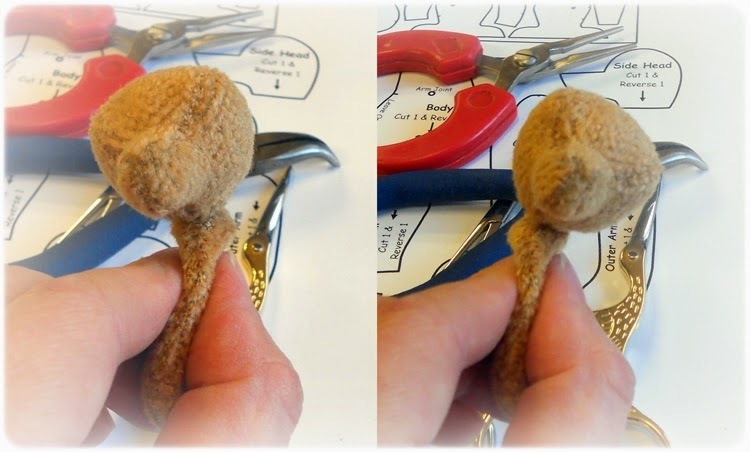 When making a wobbly neck joint, the eyes of the split pin might be visible in the neck area of the bear, espeially with tiny bears. Try to tighten the split pins really well, so that they are not too obvious. If the eyes of the split pins were large enough to start off with, the neck will still wobble quite well. You can see how the head tilts from side to side. This little Angus is ready to have his arms and legs jointed, and facial features added. We will do that in a future lesson. My book page for Lesson 12. This is Phillys' Project 52 book. She is laminating her pages. It looks so sturdy and neat, I'm impressed!